That's a bold statement, but when it comes to pre-seed weed control in cereals, we've got the products to back it up. Corteva Agriscience™, offers four cereal pre-seed herbicides, all with SoilActive™ technology, for extended broadleaf weed control. That means, the weeds on the surface are controlled, as well as the weeds that have yet to emerge, so you can seed into clean fields next spring. All four Corteva pre-seed herbicides contain SoilActive technology, which lets you control emerged weeds at the time of application, and weeds that emerge up to two weeks after spraying. Glyphosate is not enough to control key weeds. Pre-seed applications offer real advantages, but glyphosate alone does not provide full control of some winter and spring emerging annuals. Cleavers, dandelion, narrow-leaved hawk's beard and flixweed require early control. When spring moisture levels are high, these weeds will regrow quickly, so control prior to seeding is important. Glyphosate is not enough for tough winter annuals. Winter annuals like narrow-leaved hawk's beard, cleavers, chickweed and stinkweed emerge in late fall and overwinter as rosettes or 3- to 4-leaved seedlings. Come spring, they set seed and flourish ahead of crops, outcompeting for moisture and nutrients. Glyphosate is not enough for weeds that flush. Flushing weeds like wild buckwheat, cleavers, dandelion, scentless chamomile, shepherd's purse and stinkweed outcompete crops for valuable nutrients and moisture, spring and fall. Glyphosate alone controls only those weeds actively growing at the time of application, leaving flushing weeds to keep coming back. Glyphosate is not enough for volunteer canola. Glyphosate alone will not control Roundup Ready volunteer canola. Because Roundup Ready canola is so pervasive across Western Canada, this issue will only continue to grow. Glyphosate alone only controls emerged InVigor® and Clearfield® canola volunteers. Decrease yields by outcompeting crops for nutrients. Decrease grain quality with increased dockage. Can act as a host for blackleg and increase flea beetle pressure (because the seed is untreated). Can act as a host for clubroot and, if not controlled, help it spread." Glyphosate is not enough to manage glyphosate resistance. Glyphosate resistance is a growing concern due to its frequent and repeated use. Glyphosate contains just one active ingredient and works through one mode of action. Effective herbicide resistance management requires the use of products with multiple modes of action that deliver overlapping activity on the same weeds. Weeds escape in odd shaped patches. Some labeled weeds are controlled while others are not. Records show repeat use of the same herbicide or herbicide group. Escapes aren't attributable to environmental conditions or emergence after application. The same herbicide or group fails in the same area of a field the previous year. The best bet for growers is to get superior control with one application of Korrex II or Paradigm for pre-seed rather than hoping for the best with glyphosate alone, or worse, with multiple glyphosate applications. As a multi-mode of action product, Korrex II and Paradigm for pre-seed are effective resistance management tools that can help slow the development of glyphosate resistant weed populations. Glyphosate is not enough for weeds yet to emerge. To control weeds that have not yet emerged, Korrex II or Paradigm for pre-seed deliver 2 weeks of SoilActive technology, controlling both actively growing weeds and those that emerge following application. It allows growers to spray earlier and trust the technology to control weeds until their crop is in the ground. Susceptible weeds include: volunteer canola, wild buckwheat, flixweed, cleavers, stinkweed, chickweed and more. Spray Korrex II or Paradigm for pre-seed two weeks ahead of seeding, and as susceptible weeds emerge in treated fields, they take up the active ingredient through their root systems, stopping growth. Glyphosate is not enough to support early seeding. Research suggests yields increase with early seeding*. Seeding early, in mid to late April or early May, allows the crop to make good use of available moisture, get a head start on weeds, and flower earlier, resulting in less heat stress. Early-seeded cereals produce higher grain quality and increased yields when seeded into clean fields. To produce top yields, early weed control is essential. Paradigm for preseed and Korrex II allow growers to seed early into a clean field that will stay clean while the crop is established. With 2 weeks of SoilActive control, growers can focus on getting their seed into the ground as early as possible. *On matching acres of Corteva Agriscience canola hybrids and your fall pre-seed purchase. Corteva Agriscience brands include: Brevant™ brand, Pioneer® brand and Pioneer brand D-Series canola hybrids (up to $2.25/acre). 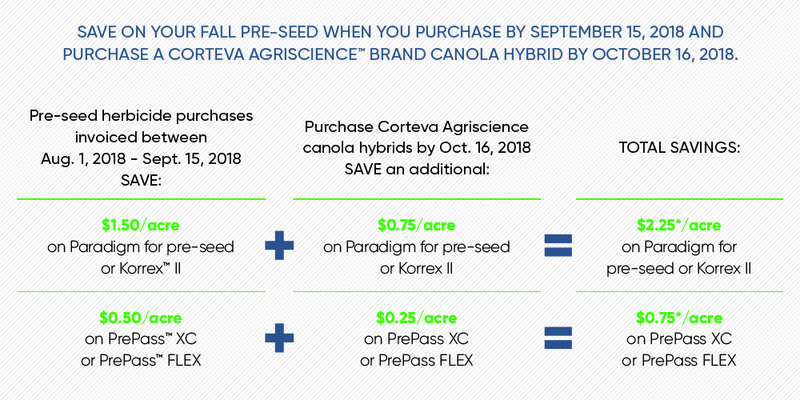 Commit defined: Contract, book or purchase your Corteva Agriscience brands by October 16, 2018. The discount will be paid as a rebate based on your invoiced purchases of eligible products between August 1, 2018 and October 16, 2018. Minimum 200 acres required. Paid as a rebate on top of any savings from the 2018 Diamond Rewards program. Corteva Agriscience reserves the right to amend this offer at any time. I like to recommend this in the fall on canola stubble, helps a lot with flushing volunteers esp going into winter wheat. we like to use it in the fall to deal with cleavers to keep them from overwintering and becoming a bigger issue in the spring. we like it because just makes spring a lot easier. we choose to use it on every acre that's going into cereals the next year. Prepass Flex is really handy too. I've fall applied #prepass on canola stubble to have extended control of volunteer canola and the results were excellent! How can I tackle tough winter annuals? Winter annuals emerge late fall and overwinter as rosettes or 3-4 leaved seedlings, ready to go to seed and flourish the moment spring arrives, and ahead of your crop. These tough winter annuals will out-compete your crop for valuable moisture and nutrients. Seed early into clean fields with Paradigm for pre-seed or Korrex II for extended SoilActive control of winter annuals and broadleaf weeds in barley, durum and spring wheat. Remember, a long fall with good moisture can produce bigger winter annuals in denser populations. And in all conditions, when spring hits, winter annuals will grow faster and out-compete your crop for valuable nutrients. What flushing weeds should I watch out for? Doesn't glyphosate cover all the key weeds? On its own, glyphosate also does not alone provide fully effective control of some winter annual weeds and spring emerging annuals. Cleavers, dandelion, narrow-leaved hawkâ€™s beard and flixweed are all weeds that need to be controlled early. In areas where spring moisture levels are high, these weeds will regrow quickly with warming soil temperatures, making early control a must. Another concern with applying glyphosate alone prior to seeding is that it contains just one active ingredient and works through one mode of action. Effective herbicide resistance management programs involve the use of products with multiple modes of action that deliver overlapping activity on the same weeds. In addition, glyphosate alone will not control Roundup® Ready volunteer canola. Because Roundup Ready canola is so pervasive across western Canada, this issue will only continue to grow. Glyphosate alone only controls emerged InVigor® and Clearfield® canola volunteers. Korrex II and Paradigm for pre-seed from Corteva Agrisciences is a highly effective pre-seed application option that delivers superior control of a wide range of early emerging winter annual and broadleaf weeds. It provides better control of winter annuals than glyphosate alone and controls all varieties of volunteer canola. As a multi-mode of action product, Korrex II or Paradigm for pre-seed are also an effective resistance management tools. Do I really need to worry about volunteer canola? Because volunteers do not have a seed treatment they can act as a host for blackleg and increase flea beetle pressure. Volunteer canola can act as a host for club root and, uncontrolled, aid its spread. It's important to control all volunteer canola, and of course, glyphosate alone will not control Roundup® Ready volunteer canola. PrePass™ XC from Dow AgroSciences is a highly effective pre-seed application option that delivers superior control of a wide range of early emerging winter annual and broadleaf weeds. It provides better control of winter annuals than glyphosate alone and controls all varieties of volunteer canola. As a multi-mode of action product, PrePass is also an effective resistance management tool. Should I be concerned about glyphosate resistance? Growers are right to be concerned about glyphosate resistance as more and more acres receive repeated applications. To manage glyphosate resistance it's important to not have repeated applications of glyphosate alone, as that is the fastest way of selecting and increasing resistant plants. Growers should attempt to get superior weed control of hard to control winter annuals and spring emerging annuals, all types of volunteer canola and broadleaf weeds for two weeks with one application of Korrex II or Paradigm for pre-seed. With Korrex II or Paradigm for pre-seed you can seed into clean fields and use its multi-mode of action as an effective resistance management tool. Weed escapes in odd shaped patches. Some labelled weeds are controlled while others are not. Records show repeated use of the same herbicide or group of herbicides. The same herbicide or group failed in the same area of the field in the previous year. Does weed competition really impact my yields? Wheat yield losses due to weed competition can primarily be attributed to a decrease in tillering. The actual weed density at which wheat yield losses occur is weed species and environment dependent. Generally, the greater the weed density the greater the yield losses (Figure 1).